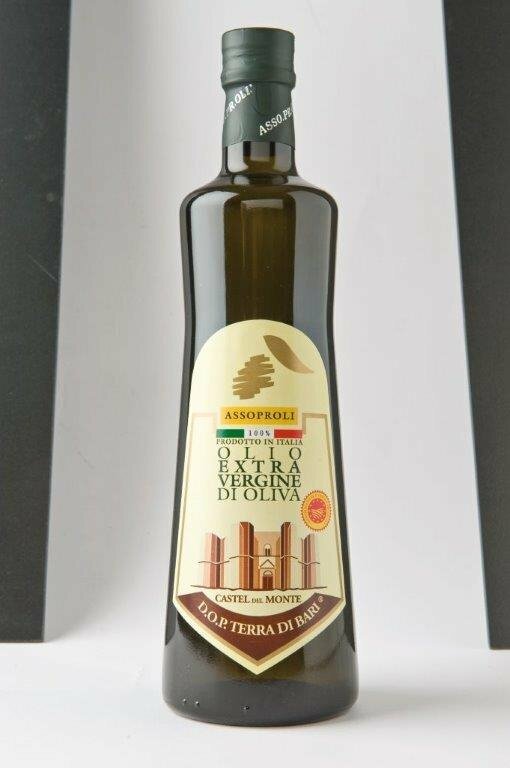 This extra-virgin olive oil comes from the production area in the north of Bari, at the foot of Castel del Monte. Its intense and particularly fruity taste, together with its bitterish aftertaste and its peculiar tingling make this olive oil unique. The tingling of the olive oil is not always understood; it indicates its beneficial characteristics because it is due to the presence of polyphenols, which are natural enemies of free radicals and help us prevent cell aging. This oil is obtained from the olive tree variety called Coratina, available in the olive-yards to an extent of at least 80%. Olives are harvested directly from the tree by hand or with mechanical devices. For the olive oil extraction the only mechanical and physical processes permitted are those that allow to produce olive oil avoiding any alteration of the fruit characteristics. The oil must be produced within two days after the harvest. Roast meat, legumes, cooked vegetables and salads.